Sometimes I think about how much I love Rufus. I think about how the sound of his cry makes me shoot out of bed and go running down the hallway. I think about how much I ached and yearned for him when I thought he might not be at all. I think about how a giggle from him, the arch of an eyebrow, can undo me completely. I love this child so much. I love him on good days, when we are healthy, laughing, present with each other. I love him on the days when I am scattered, he is struggling, I have been hit or bit again and I’m losing patience. If I think about this love too much it is both a joyous balloon lifting me up and this fragile and tender heartache that terrifies me. And then I think about my mother. She loves me like this. This is what it is to be loved by my mother. This is what most mothers feel. Somehow we all walk around living our lives with this great, huge thing happening right below the surface. I hope I tell my mom enough how I know that she loves me like I love Rufus and I love her right back. I always love photographing Becca and Macey. We love to chat motherhood and marketing- and Macey is such a freakin’ character. 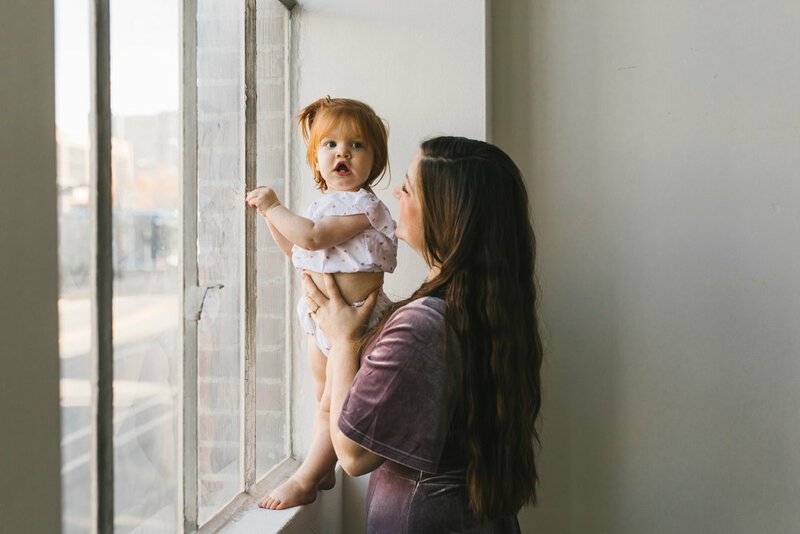 There is so much personality packed into that sweet little redheaded child. I felt like my words about love could live alongside these photos because Becca is an incredible mother who totally gets it.